"Caramelized onions give this incredible side dish a subtle sweetness, and the addition of horseradish gives it a little attitude! They make an absolutely fabulous side dish to prime rib, and have become a tradition every year at family holiday gatherings! To save time, the caramelized onions can be made ahead of time and refrigerated, then warmed before adding to the potatoes." Melt 3 tablespoons butter in a large skillet over medium-high heat. Add the onions and cook for 5 minutes. Reduce heat to medium, and continue cooking, stirring frequently, until the onions have softened, and achieved a deep brown color, 15 to 25 minutes. Stir in vinegar and thyme, and cook for 5 minutes more. While the onions are cooking, place cubed potatoes in large pot and cover with salted water. Bring to a boil, then reduce heat to medium-low, cover, and simmer until the potatoes can be pierced easily with a fork, about 20 minutes. Drain the potatoes in a colander, and allow to steam for a minute. 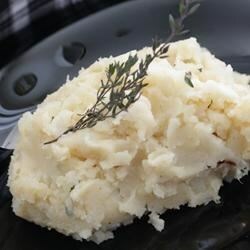 To finish the dish, transfer the potatoes to a serving bowl, and use a potato masher to mix with Dijon mustard, horseradish, salt and cracked black pepper until smooth. Mix in softened butter, caramelized onions, and half-and-half until onions are distributed evenly. Fantastic recipe! I added a couple of cloves of fresh roasted garlic, but add garlic to almost everything. I also added in a couple of dashes of white pepper!